Keno Tractors is your authorized dealership for Jinma, Mahindra, and Branson tractors, as well as ODES UTVs. We sell a variety of tractor makes and models including Jinma, Mahindra, Kubota, Ford as well as tractor parts and equipment! We have a consistent selection of new tractors, and a changing selection of used tractors, so check back often! We work hard to have the lowest prices, best value, and the highest level of customer service. Take a look at all these happy customers and read some of our customer testimonials. Tony from Mt. Shasta came to Keno Tractors for his new Mahindra 2538 Hydrostat Cab Tractor w/Quick Attach Loader. He’ll be enjoying that warm cab come next Winter while he’s plowing snow and this Summer in the AC while working on his side job projects. Congrats Tony. You’ll be working in style. 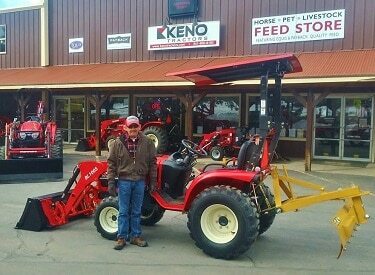 Doug from our hometown came to Keno Tractors for his New Mahindra 2538 Tractor, Loader, Backhoe, Rake, Blade, and a Mower. It sounds like things will be a lot easier to get done at your house, Doug. Congrats! and Thank you for buying from Keno Tractors. It was worth the 5-hour drive to Keno Tractors for Corey and Kristy. They got a GREAT deal on their new Mahindra 1538 Tractor, Loader and Backhoe. Congratulations you two! and Thank You for choosing Keno Tractors. 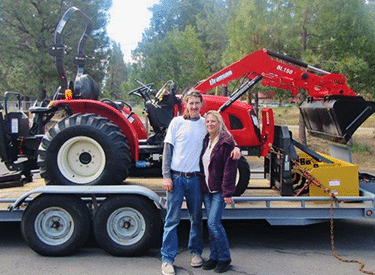 Tom from Klamath Falls got a New Branson 2400H Tractor, Loader, and a tilt angle Rear Blade. Good timing with the weekend snow we got! Thanks for choosing Keno Tractors to help you with your purchase. 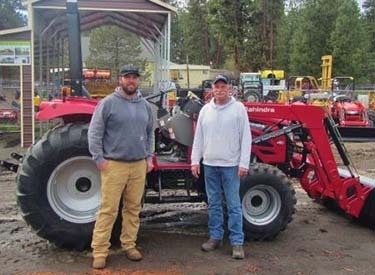 Lloyd and his son traveled from Ferndale, Washington to buy his new Mahindra Max 26XL Shuttle Tractor, Loader and Backhoe. That setup should keep you busy Lloyd. Enjoy! 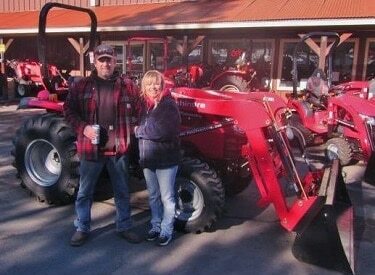 Frank and Janet came to Keno Tractors to get a GREAT deal on a Used Mahindra 2565 Cab Tractor. Nothing makes tractor life easier than a nice cab. Especially during weather like we’ve been having. 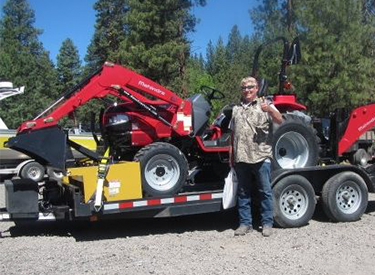 Carl from Lucern Valley, California previously owned a Jinma 204 and liked it so much that when the time came for a new tractor, he came to Keno Tractors to buy a Jinma 254. 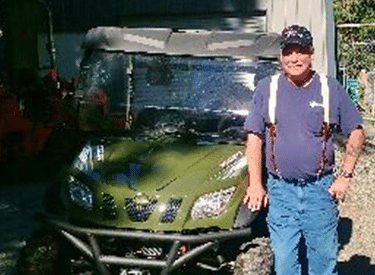 Congratulations Carl and we’re sure that you’ll enjoy using your new Jinma on your ranch as much as you have enjoyed your previous one. Happy Pre-Valentine’s snow storm everybody! 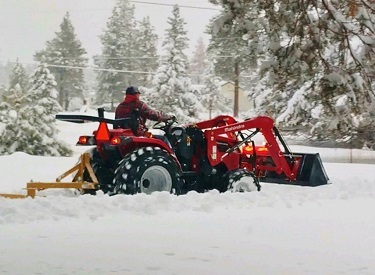 Jason Pitzer in our home town of Keno Oregon, was glad to have their new Mahindra Tractor to dig them out. It’s days like yesterday’s snowstorm that make you a PROUD tractor owner! Glad you’re enjoying that tractor Jason and Nan. After shopping around Dale came to Keno Tractors for the best deal on their new Mahindra 7095 Cab Tractor, Loader and Box Scraper. 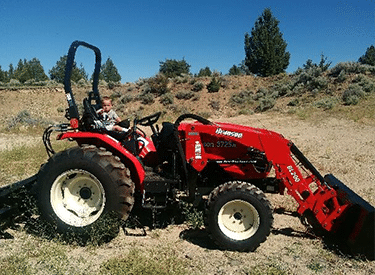 He and his son will be using this nice setup on their farm in Merrill, Oregon. They should be able to keep their roads in good shape and save themselves from the backbreaking chore of putting in fence posts by hand. 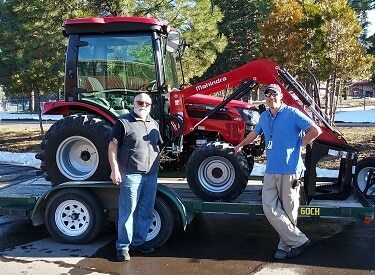 Richard from the Oroville area contacted Keno Tractors for a great deal on a Branson 4520R with a Loader, and a Backhoe. He’ll have plenty of uses for it as he does his clean up from the Camp Fire that struck in his area. 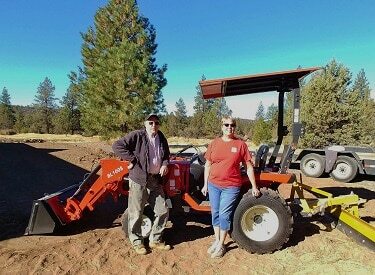 Craig and Bobbi from our home town of Keno got a new Branson 3725H Tractor, Loader, and a Box Scraper. Congratulations you two. You both should really enjoy using this new tractor. 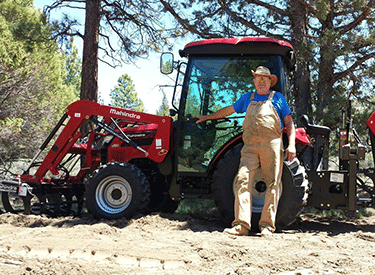 Walt from Alturas, California came to Keno Tractors to get his new Branson 4520R Tractor/Loader. 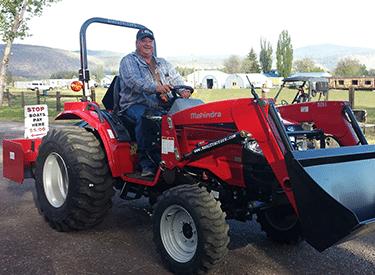 I bet Tim from Cave Junction could hardly wait until morning to try out his Mahindra 1626 Tractor! He should have plenty to do around his place with the Loader, Backhoe, Box Scraper and Auger that came with it. Congratulations Tim. That’s a set up to be proud of. John had a Christmas surprise from his wife Barbara this year. A New Mahindra 2565 Cab Tractor with a Skid Steer Loader and a Christmas bow! Keno Tractors enjoyed being in on her secret right up til delivery. 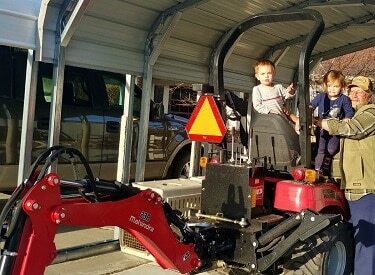 Looks like Gary from Reno has some Future Farmers of America ready to learn how to run his new Mahindra eMax 20s Hydrostat Tractor. With the new Loader, Backhoe and Mower they should have enough essentials to take care of any work they might have around their place. 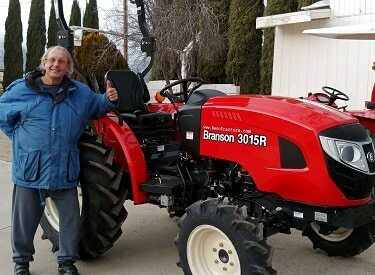 Andy, a returning customer traded in his Jinma tractor for a shiney new Branson 3015R. We’re glad to hear that you’re happy with your purchase Andy, and hope you stay in touch with photos of you using your new Branson. Congrats! Keno Tractors doesn’t just “sell” tractors. We want to help you find the one that works best for your needs. 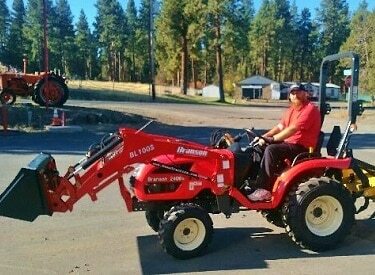 After months of shopping tractors, Joe from Southern California decided on a new Jinma 254 Tractor, Loader and Backhoe from Keno Tractors. He should find a lot of uses for it in his construction business as well as on his new property in Idaho. 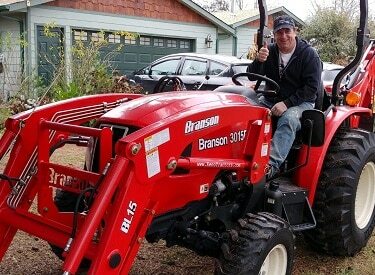 Brian looks pretty happy with his New Branson 3015R Tractor, Loader and Backhoe that he bought from Keno Tractors. He has reason to be proud of that new tractor. 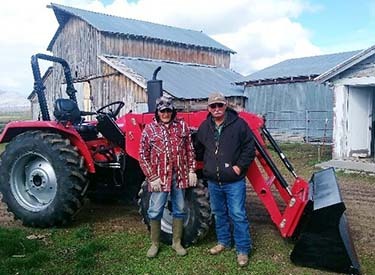 Branson designed their Midsize tractors with rugged, dependability in mind. They’re “Made of Steel” whereas some midsize tractors built today are not. It should give you years of good service Brian. Congratulations! 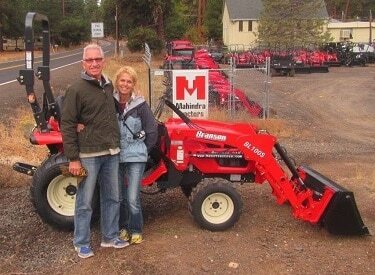 With these smiles, you can tell that Jason and Nan are so excited to get their new Mahindra 2538 Tractor and Loader. 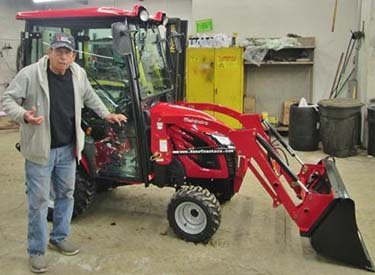 From years of working in the Parts department at Keno Tractors Nan knows first hand that they can expect years of rugged dependability from their new Mahindra tractor. Congratulations on your new workhorse Jason. At least you won’t have to feed this horse. 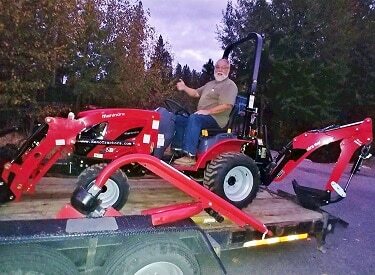 Steve just received his new Mahindra 5555 Tractor w/Loader and a Box Scraper to use around his place in Davenport, California. Keno Tractors loves to see the smile on our customers’ faces. Enjoy that tractor, Steve! 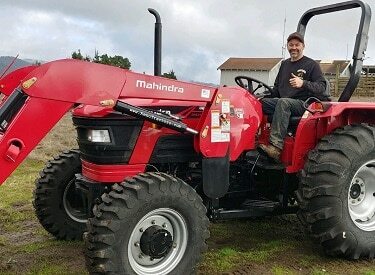 Clay from Hollister, California called Keno Tractors for a great price on a Mahindra 1526 Hydrostat Tractor with a Loader, Auger, and Box Scraper. 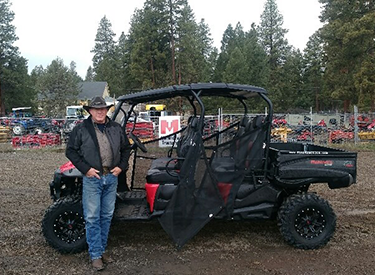 Clay should enjoy years of service from his new Mahindra workhorse. 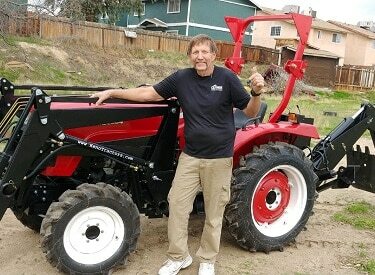 Joe from Burney, California called Keno Tractors for a great deal on a Jinma 164 Tractor w/ Loader. Congrats Joe! 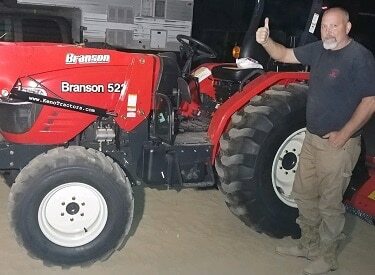 We’re sure that Tim will enjoy using his new Branson 5220R Tractor, Loader and Flail Mower on his new place in Clements, CA. 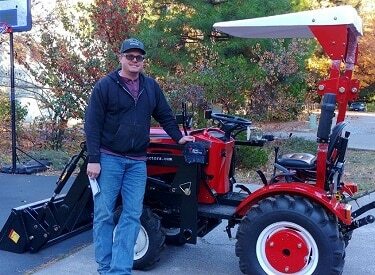 David from our home town of Keno will find a lot of uses around his place with his new Branson 2400 Hydrostat Tractor and Loader. 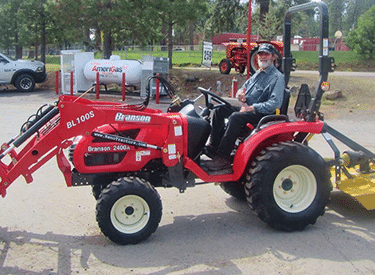 Erwin of Ukiah, CA came to Keno Tractors to add a Branson 3015H Tractor, Loader & Grapple to his Tractor line up. We’re sure that he’ll find a lot of uses for this new addition. 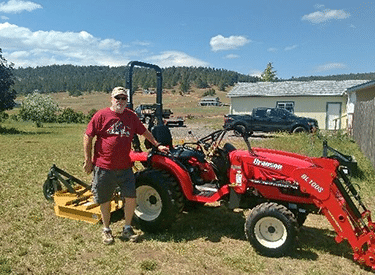 This Branson 2510 with a Loader, Box Scraper, and Rear Blade is sure to come in handy when John is working around the home place in Bonanza, Oregon. 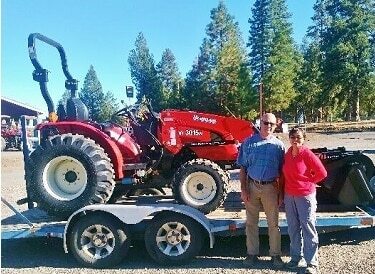 Dale from Williams, Oregon got a great deal from Keno Tractors on a Branson 5220 Tractor with a Loader, Backhoe, Box Scraper and a Mower. We’re sure they will enjoy putting it to good use around the farm. 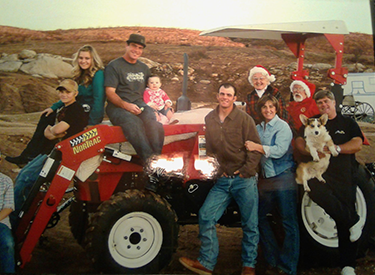 Tim and Cindy from Galt, CA got a NEW Branson 2400H Tractor to replace their old tractor. They’ll be “stylin” when they work around their property now! Backhoe and an Auger. Enjoy that new tractor, Dale. Thanks for choosing Keno Tractors. 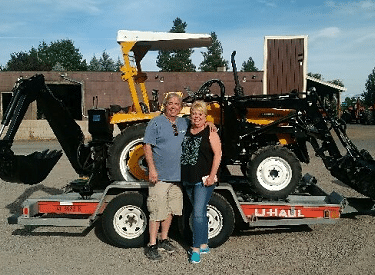 Butch and Mollie from Washington came to Keno Tractors and got a great deal on a Used Jinma 284 Tractor, Loader, and Backhoe to use at their cabin in the Blue Mountains. 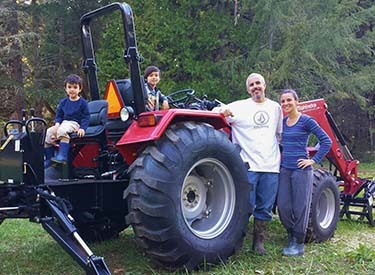 After much research over the internet, a customer called us one day about the Jinma tractor that he had purchased from someone else. 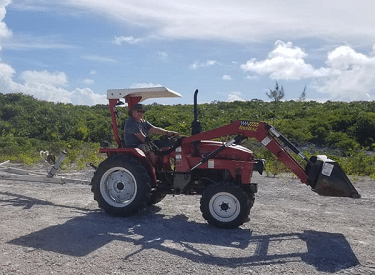 After discussing the repairs and service that were needed, the customer decided to pay us to come to him and fix his tractor in the Bahamas! 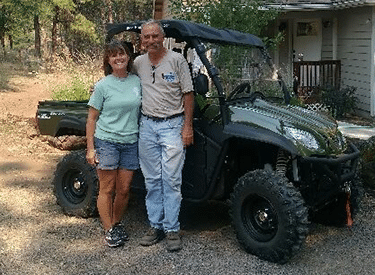 Richard and Carla from Keno got a great deal on a New UTV from Keno Tractors. This “ODES Comrade 650cc” will fill the bill when it comes time to do work around their place and can do more than that out on the trails around Keno. Enjoy your new UTV you guys! 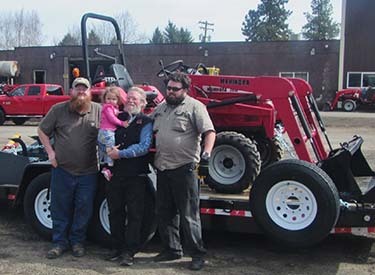 Tom from Arlington, Washington called Keno Tractors when he bought his new Mahindra 1526 Shuttle Tractor with a Loader, Backhoe, and a Rear Blade. 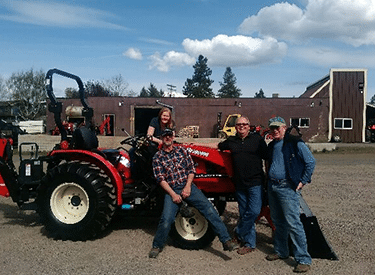 Barry from Chiloquin, Oregon came to Keno Tractors for a GREAT DEAL on a Branson 2400H Tractor with a loader and a mower. They’ll find plenty of uses for it on their farm and taking care of their goats. 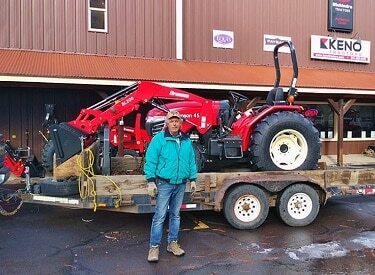 Jim from Creswell, Oregon will enjoy working with the new Branson 3520H Tractor, Loader, Backhoe, and Box Scraper that they got from Keno Tractors. This set up should keep him busy for years to come! Chuck and Dina dropped by Keno Tractors and got a New ODES Comrade UTV. They plan on using it to work in their yard and when Winter gets here they’ll get that all important Snow plow for the front of it. Of course, they’ll find a use for it this Summer recreating and for cruising the back roads during Hunting Season. Congrats you guys! 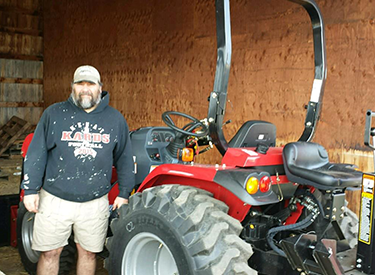 Rand Damuth from our home town of Keno, Oregon came to Keno tractors and got a great deal on a used Mahindra 3016 Shuttle Tractor with a Box Scraper, and an Auger. 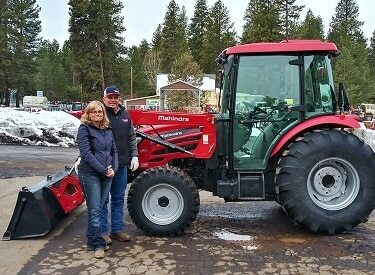 Joe and Kasandra from Klamath Falls came to Keno Tractors for a great buy on a Used Jinma 284 to use around the Stables. 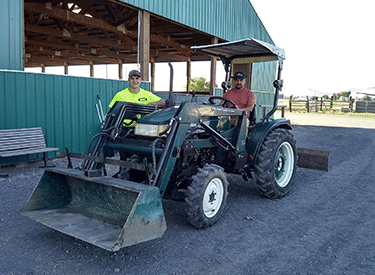 Four Winds has always been a nice, clean horse facility but with this Jinma tractor, it should be a little easier to accomplish the task. These ODES UTV’s are selling as fast as we can get them! 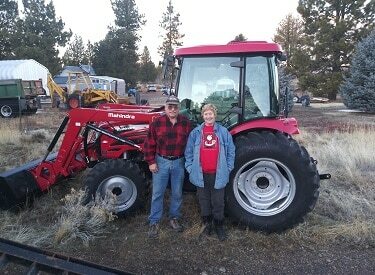 Arizona Snowbirds, Rusty and Teresa from Reno, NV came to Keno Tractors to get their new Silver, ODES Comrade 650. They enjoy Pleasure riding and Off-roading in the Mountains and Desert. This UTV should do the trick! 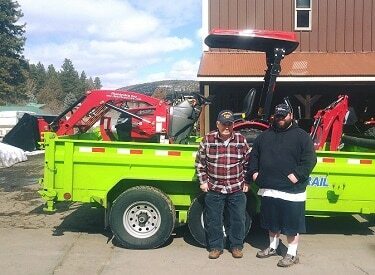 Chancey from Klamath Falls dropped by with his 2 Boys to buy a Branson 3725H with a Loader and a Box Scraper with a Tip & Tilt Kit. The boys were pretty excited! Chancey tells me he’s going to “teach the boys” how to drive it so he doesn’t have to. Well…let ’em grow a little more and keep us posted on how that works out for you Chancey. 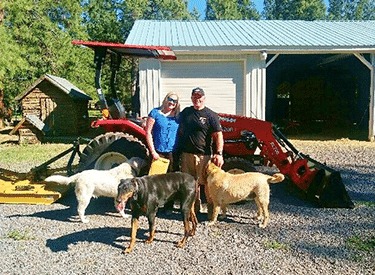 Ian and Brittany from Klamath Falls will be working in style this Summer with their new Branson 3520R Tractor and Front End Loader. And with its Box Scraper, Auger, and Mower they’ll have all the necessary attachments to make their work easier and enjoyable. 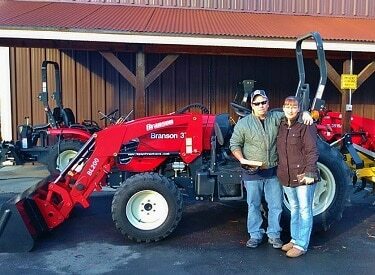 Thanks, Ian and Brittany for choosing Keno Tractors. 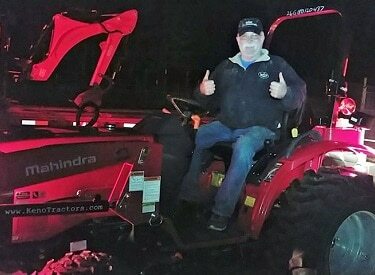 Mike came to Keno Tractors for a great package deal on a Mahindra 1626 HST Tractor with a Loader, Backhoe, and Box Scraper. He’s set to go to work! 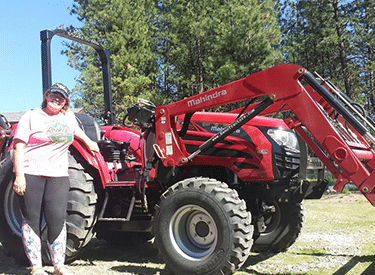 Sue now has all the necessary equipment to use on her new property in Bonanza, Oregon. 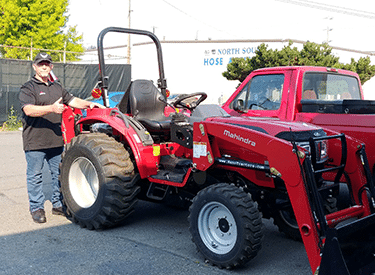 She got a great package deal on a new Mahindra Max 26 Shuttle Tractor with a Loader, Backhoe, Box Scraper, Mower, Front Blade and Skid Steer Forks along with a 16′ Used Trailer. 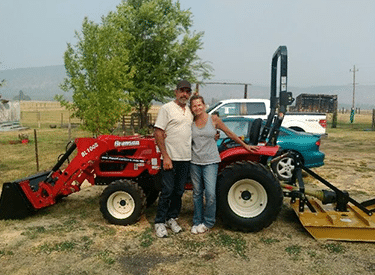 The called other dealers, but Keno Tractors made it happen for Tommy and Kimberly from Belfair, Washington. 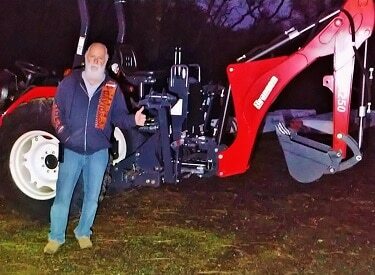 They came and picked up their New Branson 4015 HST Tractor/Loader/Backhoe, Box Scraper and Skid Steer Forks. Nice couple and what a nice tractor package! Moving to God’s Country, Southern Oregon! 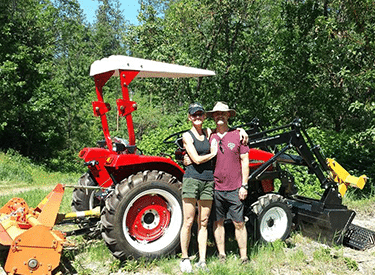 Steve and Kimberly came to Keno Tractors for a good deal on this beautiful Mahindra 2638 Cab Tractor with a Loader, Backhoe, and Root Rake Grapple. It’ll be a huge help developing their new property from scratch. What a nice outfit to get started with. Congrats! Steve and Kimberly. Looks like Dan will be getting his work done a lot easier this Summer. He came to Keno Tractors for a great deal on a new Branson 2400 Tractor, Loader, Box Scraper, and Mower. 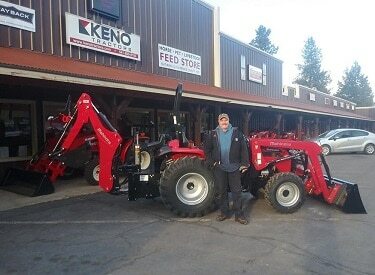 Thanks, Dan for choosing Keno Tractors! A tractor IN a truck??? Abdo came up from California to take advantage of our “Service Department”. The other guys just sell you the tractor. Did you know that Keno Tractors is the only FULL SERVICE Jinma dealer in the USA? 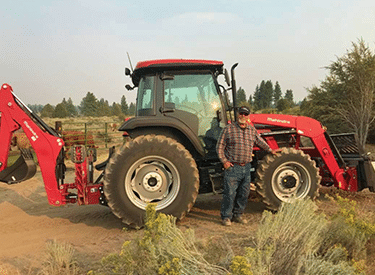 Peter from Chiloquin, Oregon got a good deal on a new Mahindra 1526 HST Tractor with a Loader and Box Scraper from Keno Tractors. One thing for sure, you’ll get your work done with that new Mahindra Tractor! 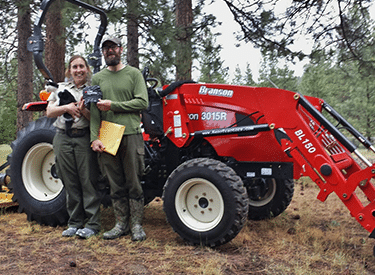 A brand new Branson 3015 R Tractor with a Loader, Mower, and Box Scraper was delivered to Brandon in Chiloquin, Oregon. The cat might not be impressed at first with this purchase, but should enjoy digging in the fresh overturned soil that the tractor will bring. 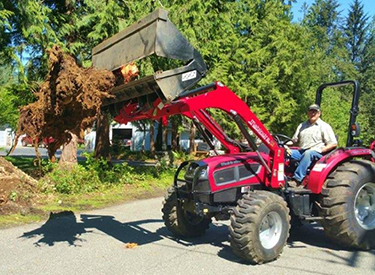 It looks like Fred is still having a lot of fun with his Mahindra 3550 and putting the 4-in-1 Bucket to good use! 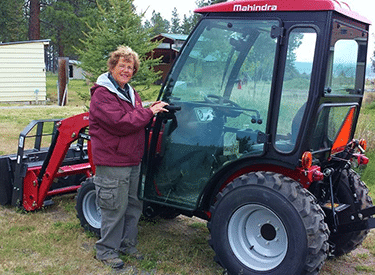 Loretta took delivery of her new Mahindra 2555 Shuttle Tractor. With the Loader, Box Scraper and Backhoe, she should have plenty to work with this Spring in Beatty, Oregon. Have fun with that tractor, Loretta! 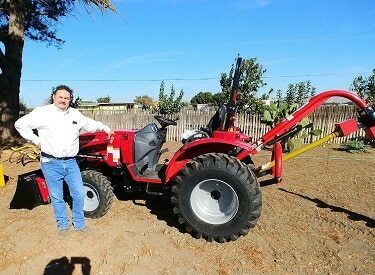 A New Jinma 254 Tractor with a Front End Loader, Auger, Rototiller, and Rake. Hmmm! David, that looks like there’s going to be a lot of work going on in Grants Pass. 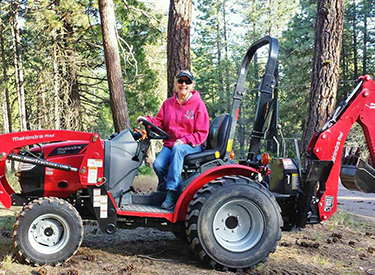 Penny just bought a Mahindra Max 26XL HST Cab Tractor with a Front End Loader, and Skid Steer Forks to use on her Ranch in Bonanza, Oregon. No doubt Penny will really be enjoying that cab for protection from the dust this Summer and the Cold this Winter! Billy from our hometown came in and bought a new Branson 2400 HST Tractor, Front End Loader and Mower. He didn’t let any grass grow under his feet either. He drove it home! John just purchased a new Branson 3515 HST with Front End Loader, Backhoe, and an Auger. Jim and the crew will be using it in the Alfalfa field, Roads and Timber on their local acreage. Looks like you’re ready to go to work in style! 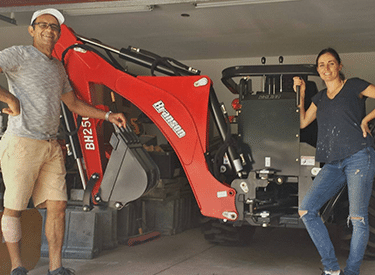 Sasetharan from Yakima, Washington came to Keno Tractors to get a good deal on a Jinma 254 with a Front End Loader, and Skid Steer Forks. Ray and his family have really been looking forward to adding this new addition to the family. 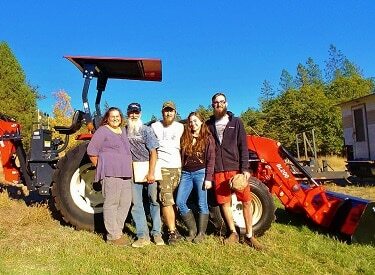 They took delivery of their new Mahindra 4540 with a Front End Loader, Backhoe, Box Scraper, Grapple, Subsoiler, Post Hole Digger, and a Rototiller. The boys were especially excited! I’ll bet we have some Future Farmers of America there. 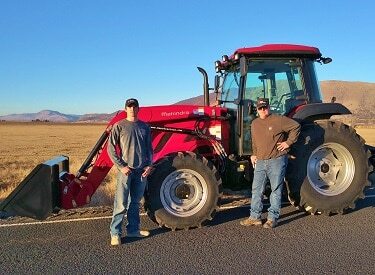 Jeremiah and Jack from Montague, California should be pretty happy with their new Mahindra 2555 Shuttle and Quick Attach loader. Enjoy that tractor, you guys! 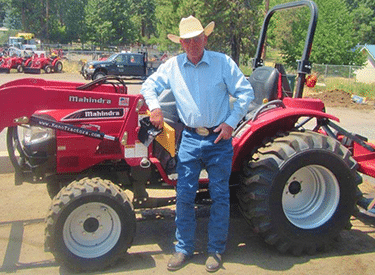 Calvin from Klamath Falls got a good deal on a Used Mahindra 4530 Shuttle Tractor and with a Skid Steer Loader. 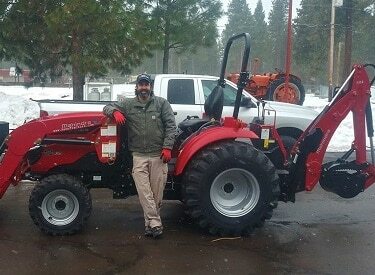 Carlos came in and picked up his new Mahindra eMax20 w/ a Cab and Front End Loader. And HE DROVE IT HOME! Well, that wasn’t too bad. He lives here in Keno. 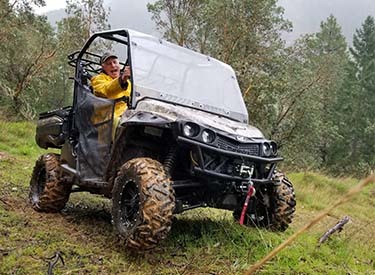 Mountain Climbing, Mudding, Log moving, perfect conditions for Bob and Kimberly’s new Mahindra 1000S diesel XTV. Sounds like Bob and Eric were having way too much fun on this in Oakland, Oregon. 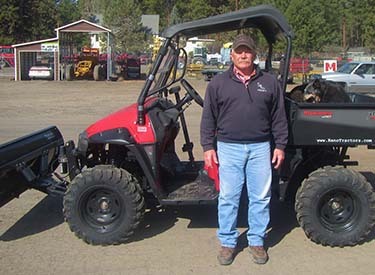 Steve, a well known local Australian Cattle Dog enthusiast & breeder, stopped by Keno Tractors and got a great deal on a lightly used Mahindra 750B XTV. He said his dog family will soon be outgrowing his old 4-wheeler and he needs one that can carry the whole pack! This one will do that Steve! 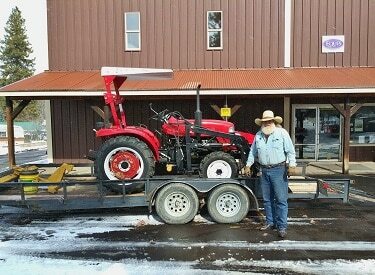 Tom from Antioch California got a good deal on a Used Mahindra 2816G Tractor, Front End Loader, Box Scraper, and an Auger. Looks like he’ll be taking advantage of this Spring weather. 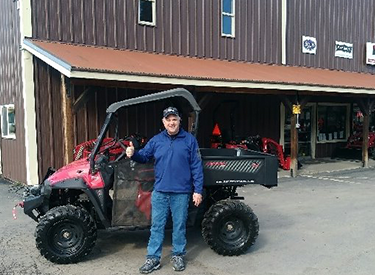 Clint, a returning customer from Klamath Falls, added a Mahindra 750B XTV to his line up just in time for Spring. Now’s the time to get out there and enjoy the Great Outdoors! 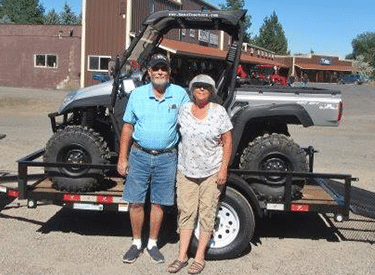 Len and Lisa are planning on hauling their grandkids around in their new 6-seat Mahindra XTV. We’re sure that besides that, they’ll be able to find plenty to do with this new XTV. 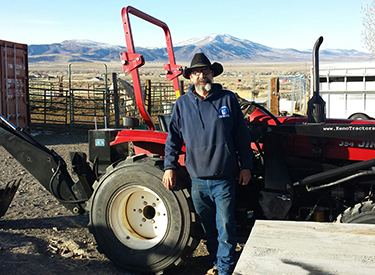 Chris from Fernley, Nevada just got a great deal on a Used Jinma 354 Tractor, Loader, Backhoe, Auger, Rototiller and a Box Scraper. Wow, Chris! You are set to go to work regardless of the season. Congratulations! 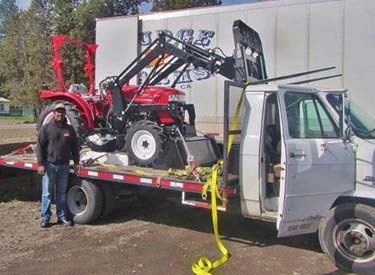 This is a nice photo and testimonial about a Nortrac (Jinma) tractor from a man who ordered parts from us. “This tractor saved my home!” says Keith. Unfortunately “as you can see in the picture it burned the rest of our 30 acres.” Keith, we’re so sorry that the fire burned your land. But glad that you were able to use your tractor to save your home. 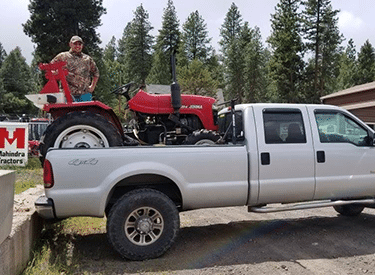 Greg from Bend, Oregon purchased a new Mahindra 2538 HST Tractor, along with a Loader, Backhoe, Mower, Rototiller and an Auger/Post Hole Digger to use around the new place. Thanks, Greg for calling Keno Tractors!